Steve Ballmer just confirmed in his CES keynote that HTC’s HD2 will indeed be coming to the US, as a T-Mobile exclusive. The 1 GHz Snapdragon-powered handset should arrive sometime in late February or early March, according to current information. Customized T-Mobile builds of Windows Mobile 6.5 for the HD2 have been floating around on the XDA-Developers forum, but now we have the first official confirmation of the phone’s stateside arrival. HTC followed up on Ballmer’s announcement with a press release, which we’ve printed below. 3G coverage is not available everywhere. For information where T-Mobile 3G service is available or to see T-Mobile’s Personal Coverage Check tool, please visit http://www.TMobile.com/Coverage . Based in Bellevue, Wash., T-Mobile USA, Inc. is the U.S. wireless operation of Deutsche Telekom AG. By the end of the third quarter of 2009, almost 151 million mobile customers were served by the mobile communication segments of the Deutsche Telekom group — 33.4 million by T-Mobile USA — all via a common technology platform based on GSM and UMTS, the world’s most widely used digital wireless standards. T-Mobile’s innovative wireless products and services help empower people to connect to those who matter most. Multiple independent research studies continue to rank T-Mobile among the highest in numerous regions throughout the U.S. in wireless customer care and call quality. 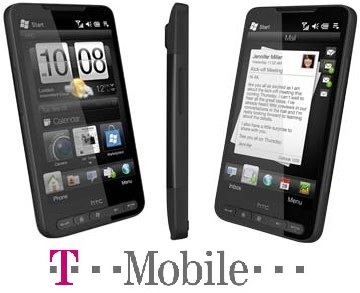 For more information, please visithttp://www.T-Mobile.com . T-Mobile is a federally registered trademark of Deutsche Telekom AG.